RU? Instant Reaction Review Podcast Ep. 32 - Cloud Atlas - Are You Screening? Like everyone else (whether you like the movie or not), Cloud Atlas wasn’t quite what we were expecting. Unfortunately, there are many ways in which the elements that make it up were a bit too much of what we were dreading. It turned into a fun show, even if we both came down well to the negative when it came to our impression of the film, and I think it had a lot to do with the fact that Shane read the book, and I hadn’t. I always plan to read the book, if at all possible (and it really wasn’t this time around), but I thought it came together well in this case, because we had the perspective of both types of movie-goers. Oddly enough, Shane talked about the two “stories” of the book he found least interesting, and they turn out to be the two that the film pays the most attention to, and delivers best. There’s certainly a quirkiness to the thing that makes it interesting overall, but the film ultimately fails, and in very nearly the exact same way that the second and third Matrix movies do. Those telling the story, to sum things up simply, suffer from the delusion that they are a great deal smarter than everyone else. 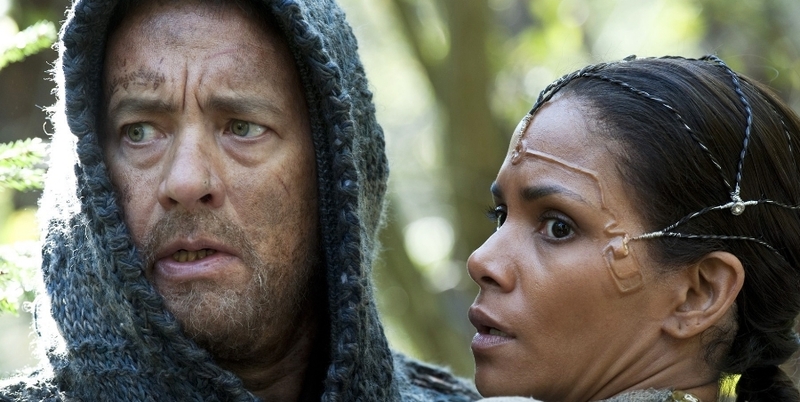 Still, it’s almost worth seeing just for the scope of the attempt, and there’s a decent game of trying to figure out what is going on with Tom Hanks‘ make-up. It can be fairly enjoyable if you go at it from the right perspective, and are mostly interested in the spectacle of grandiose efforts, but in this case the whole is actually much less than the sum of its parts.